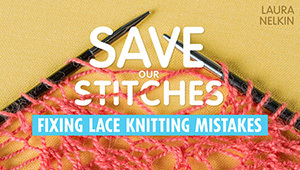 When you click on a link below and make a purchase, you're supporting Knitty. We thank you! 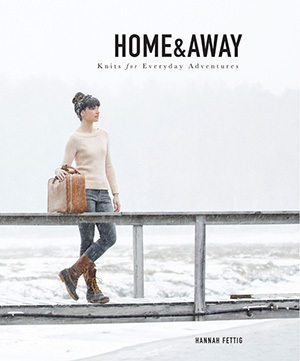 Home and Away is a book of eight sweaters and a hat. But like all of Hannah Fettig's patterns they are much more than that. Her patterns are straight forward to knit, even possible as a first sweater, and the type of patterns a knitter can see living their life in. Her patterns aren't the spur of the moment, ‘what's in fashion this second' designs, but the kind that won't go out of fashion ever. The sweaters are ones that a knitter will pull from their closet again and again and reknit several times in different yarns. Home and Away is Hannah's first big self-published book and it is exactly what I expected. The thought in the planning, the execution, the photography, the extras included, even the paper is beyond the expectation of a regular knitting book. Each sweater pattern is written as both a top down raglan and a bottom up, in pieces to seam pattern, letting the knitter choose. She even provides discussion about the benefits and downfalls of each style. I have never seen this in knitting patterns before and I applaud it wildly. There are points in the book where she clearly welcomes new knitters, the ones knitting or contemplating their first sweater, sections on gauge, choosing assize and how to read a pattern, just enough to give a new knitter confidence but not enough to make it feel like a ‘new knitter' book to more experienced knitters. All of the patterns are knit from Quince and Company yarn and she includes an interview with founder and guiding light Pam Allen. The photographs are bright, large and beautiful; if you don't already want to visit or live in Maine they will sway you in that direction. Everything in the book is large enough to see, the patterns aren't cramped, the detail of the sweaters are visible, there is actual white space in the page design; it is simultaneously restful and inspiring just to page through. Each copy of the book comes with a code for an electronic version for knitters who would rather carry their patterns in a tablet than a book. This book is masterful, giving quality patterns, thought through for many different knitters wrapped in a beautiful package showing the heart and excellence of modern independent publishing. Sequence knitting is a new approach to creating knitted fabrics by knitting the same sequence of knit and purl stitches again and again. It gives you the freedom to create complex fabrics without having to follow charts or detailed instructions. Without these distractions, you can gain a deeper understanding of the use of colour and texture in knitting. This is illustrated by the many beautiful and inspiring swatches and projects such as scarves, hats and shawls. The book is a very-large-format hardcover with high-quality paper...an investment book, to be sure. Campochiaro starts with explaining the concept of sequence knitting, something many knitters may wittingly or unwittingly be familiar with: a well-known example is Stephanie Pearl-McPhee's One Row Hand-spun Scarf, but also mainstay patterns such as ribbing and moss stitch fall under this category. There are different ways of creating 1-row patterns, and they can be categorised in different types of fabric, and all are explained in clear language and illustrated with swatches. 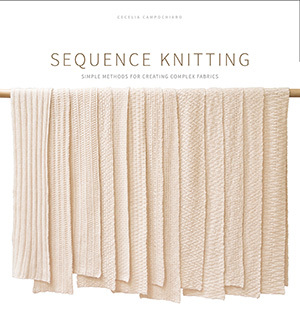 Sequence knitted fabrics are reversible, and some work beautifully with more than one colour, and the knitting projects in this book use these qualities to great advantage. The last chapter expands on how you can explore fiber and color together to develop new fabrics. It's surprising this hasn't been written about before, as the premise of sequence knitting is inherently simple. This stimulating book had my mind racing about the possibilities, and, encouraged by the author, I have started to think about other stitches that build on the simple concepts presented in this book. I hope you feel inspired, too! 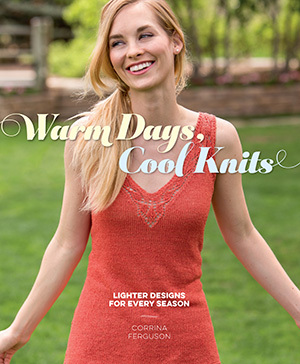 Simply Modern Lace is a greatest hits collection of lace knitting patterns from Interweave books and Knits magazine. The selection is first-rate, patterns I forgot that I wanted to knit and patterns I had bypassed the first time around. The patterns are well selected, sweaters, shawls, hats and socks. They are wide ranging in the amount of lace from the just a little lace in the garter stitch Greenfield cardigan by Melissa LaBarre to the gossamer Rosebud shawl by Margaret Stove. Included are reprints of lace articles on reading charts, shaping in lace and casting on and binding off in lace. 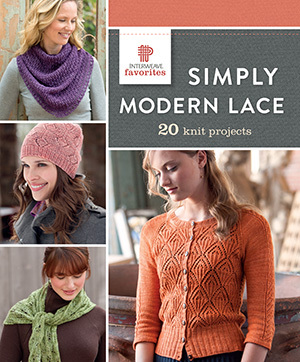 This book is a solid collection for a lace-loving knitter. In her first book , Florida resident Corrina Ferguson has created a great collection of patterns for warmer climates and those of us whose bodies just run a little warmer. Unlike most warm weather knitting books, this book is not just a collection of tanks and shawls. She wisely acknowledges that there are still seasons in warmer climates (I consider over-air conditioning a season) and different people have different tolerances for heat and cool. The patterns are divided by season with Winter having cardigans and longer-sleeved sweaters, hat and socks and Summer having tanks, tees and lacy shawls. She doesn't shy away from wool for warmer weather, but she uses blends. Most of the patterns are knit from a wool blend yarn with silk being the favorite partner in wool. The designs just look cooler, not just by using less fabric, but by using drape and open stitches. The designs are modern and feminine, with lots of lace and shaping in bold colors. Standouts for me by season are Winter: Lochlan hoodie; Spring: Coralue tee; Summer: Junius shawl; Fall: Bayard pullover. I hope Corrina keeps bringing more warm weather (and warmer body) designs! Sock knitters often seem to get into conversations about which way to construct socks -- or which sorts of needles to use -- is "better". According to Lara Neel (and with apologies to Yoda), There is no bad -- there is only sock. In this book, Neel covers a great deal of sock know-how. 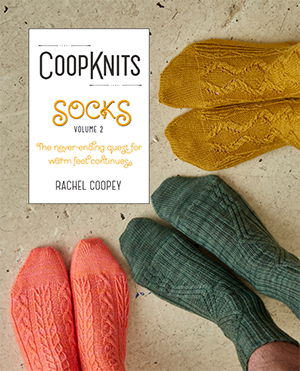 In her chapter on shaping, she addresses the variations that come from choosing to knit top-down versus toe-up, but then she goes one step farther than the other sock books I own: she talks about which choices to make depending on what foot you're trying to fit. She offers suggestions for blunt, normal and tapered toes; narrow feet and wide; high arches and low, even down to changes that could be made to accommodate a heel spur like her sister has. Her recommendation to do a "wet foot test" is shockingly simple and very, very helpful. While this book could be used by a new sock knitter (Neel's Training Wheel Toe instructions are included to get a newish sock-maker started on toe-up socks), there is so much meat here that it will definitely be of interest to advanced sockateers and sock designers. I mean, how can a sock nerd's heart not beat faster at seeing chapter headings like "How flaps and turns affect gussets"? There are 17 full sock patterns offered here and oodles of variants. All the patterns are (as Knitty's tech editor Kate Atherley calls it) "needle agnostic", meaning that they are not written with specific needle instructions and so may be easily worked by anyone using double-points, two circulars, magic loop or one small circular. In a few places I've found names for things that I've been doing for a decade but didn't know they were called anything in particular (the wide wedge toe, for example). There are even a couple of options offered in place of grafting to finish top-down socks, for those grafting-phobic folks. My review copy was a digital version which had great internal indexing, and out-links to sources and references (of course, you have to be connected to the internet for those to work). I loved the photo index with clear pictures of each sock in the pattern section. In fact, the photography as a whole was spectacularly clear. My favourite patterns were Checked & Square (in both top-down and toe-up options), the gorgeous patterning of Uncommon Dragon, and one called Procrastinatrix that seems made just for me -- an otherwise uncomplicated sock with a super clever afterthought heel (that it is also offered in top-down and toe-up versions makes my little woolly heart happy). In Neel's opening chapter "Inspiration from the Museum", she discusses some of her research and sources along with her musings on even more design questions she has yet to pursue. It's hard to believe there is more to know about socks that isn't already here. Part design collection, part art history lesson, From Folly Cove is a delightful gathering of patterns and stories based on the work of The Folly Cove Designers, a group of women textile artists from the 1930s. Each design in the collection is a tribute to a particular artist and influenced by a particular work. If you are unfamiliar with the work of the Folly Cover Designers, here's a place to take a peek. I wish some of the art had been reproduced in the book so everyone could see how cleverly Julia interpreted two-dimensional art into three-dimensional garments. Julia's garments are classically feminine without being frothy. I love that of the 11 designs, 7 are sweaters, skirts or vests. I hope this starts a trend to bring back sweaters to publications. Julia's designs are deeply thought out as far as fit and shaping. She designs for knitters that like a little extra thinking with their patterns. The Burton Hills Jacket, with short rows mimicking hills, is my favorite of the collection; it's a really cool update of a barn coat. I can't quit looking at it and reading the pattern and every knitter knows what that means. I'm a geek. So is the woman who wrote this book. 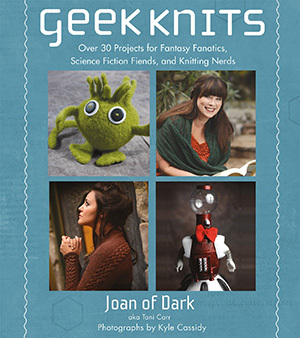 In Geek Knits she taps into one of the key aspects of fandom: wanting to surround yourself with things based on the worlds you read about or see on tv or film. And each design has been shot on or near a famous geek person. Such as the lovely uberGeek on our cover, Neil Gaiman; Game of Thrones author George R. R. Martin and many more. This book covers the three basic species of geek: the ubiquitous SciFi geek, the Fantasy geek and the Everyday geek. The patterns cover the range from frivolous and amusing toys to really lovely garments. In the SciFi section, I love the Bad Robot fingerless gloves (that are intentionally reminscent of a big British tin can intent on Extermination) and the Star-Trek inspired Red-shirt sweater. For your cat. There's	also	a pair of socks striped to match the 4th Doctor's iconic scarf. In the Fantasy section, we find my favorite pattern in the book: a stunning Fair-Isle sweater worn by Mythbusters' Adam Savge, called the Muggle Artifact Sweater (supposing that Mrs Weasley would have knitted this for her Muggle-artifact-loving husband). There's also a wee Direwolf sitting on Mr. Martin's beefy shoulder. In the Everyday section, we have the tributes to Sherlock Holmes, like the excerpt we're featuring on our cover, the Baker Street Scarf, as well as a great Deerstalker hat. There are lots more patterns for any geek to love contained in this book. It's a (phaser) blast to read and beautifully photographed. May the author Knit Long and Prosper! I was SO excited to get to review this title. As I recall, I gushed more than a little about the first volume and the excellent, juicy photography of Jesse Wild. Coopey's great eye for scale, colour and pattern are back in a collection of twelve fresh sock designs made mighty enticing again by Jesse Wild. The first pattern made me laugh out loud. Called "Dave", the introduction read "Everybody knows a Dave, and everyone needs some plain Dave socks." Hopefully there are more Kids in the Hall fans than just me, who immediately thought of the song "These are the Daves I Know". Even the Dave sock offers instructions for two kinds of heels. The other socks in the collection present a smorgasbord of patterning including travelling stitches, cables, lace, and colourwork. Any "second sock syndrome" sufferers will be well-pleased as most of the patterned socks are offered as mirror images or fraternal versions of each other. The colourwork pair, called Otis, make good use of a set of gradient mini-skeins as the contrast colours on the cuff, while the foot is worked all in the main colour. There's a touch of clever here too: the socks are identical, except that the beginning of round is shifted from one sock to the other so that any jogs that might be visible from colour changes are on the inside of each ankle, and less noticeable. All the socks are worked top-down, and instructions are given that are "needle agnostic", meaning that you may use dpns, two circulars or magic loop as you prefer. Sizes are offered as small-medium-large for every pattern (several are shown on both male and female feet) with information given to lengthen both foot and calf to fit. While Otis and the gradients (definitely going to be the name of my Earth, Wind & Fire cover band) are high on my list to make, the first place probably goes to the cheery Sidney for their happily related-but-not-identical mis-matched cables. With a subtitle of "The never-ending quest for warm feet continues", I kinda selfishly hope Coopey continues to suffer the chill for some time to come. For the curious knitter, this wonderfully detailed and generously illustrated guide to increases and decreases is a dream come true, and the answer to many technical questions and puzzlements. Judith not only demonstrates a huge variety of increases and decreases, but she also very clearly articulates the differences between, and pros and cons of, the various techniques. It's written in a very approachable manner, and will encourage knitters of all levels to expand their toolkits. 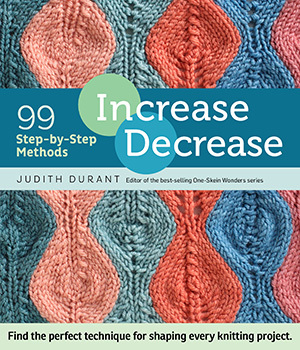 Judith helps knitters make the an informed choice next time you see a simple "increase" or "decrease" instruction the next time you're working a pattern, and designers will welcome the resource, too. I was particularly impressed with the fantastically detailed section on multiple decreases -- directional and not, visible and invisible. Although you can find many of the other techniques in other reference books, this topic is rarely covered in books, and certainly not to this level. One could quibble that the book isn't complete, in that there are always a huge variety of versions and twists on techniques -- one could argue that there's two version of the backwards loop make 1, for example! -- but it goes deep and broad, and is varied and authoritative. A must-have for any technique-oriented knitter. As soon as I received the book, I took a quick look through it and really liked the bright, clear pictures of all the projects. There is something for everyone and many gift ideas I can make myself. The instructions are easy to follow and I like that the level of difficulty is noted. T he different methods of finger knitting are shown and easy to follow. Once you learn the methods, the possibilities are endless. The Tips are useful and provide inspiration for personalizing the project. I made something for our cat, Tiffy, from one of the patterns. Overall, I think this is a good book for beginners, with a few projects to inspire someone more experienced and tired of doing the same things. Woolly does it again! A fantastic collection of hats, beautifully photographed and very well-presented in a self-published book. 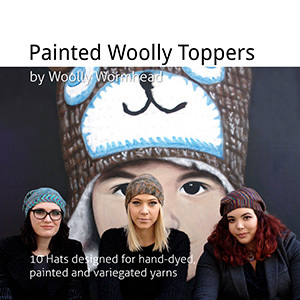 Woolly has a particular genius for designing interesting and flattering hats for all shapes and sizes of heads, and all tastes and situations. They're clever but not fussy to knit, and entirely wearable. This collection focuses on painted yarns: those hand-dyed and variegated skeins that look so very tempting in the yarn store, but can be oh-so-challenging to use well. Each hat comes in a range of sizes for kids to adults, and the book covers a broad range of yarn weights. No matter whether you're a collector of variegated sock yarns or have acquired a healthy stash of leftovers from heavier-weight garment projects, the book has something for you. The patterns are entirely approachable for knitters of all skill levels. Woolly provides good tutorials for specialized techniques that she uses. I also appreciated her sizing guide. As always, the photography is tremendous. 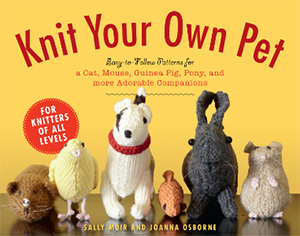 The latest in the whimsical series of Knit Your Own by Sally Muir and Joanna Osborne welcomes the biggest variety of knitters and pet owners possible. Eschewing single-species pet owners and single level knitters, the adorable pets in this volume include a goldfish, guinea pig, mouse, rabbit (paging Amy Singer!) canary, parrot, pony, bearded dragon, corn snake and a simple dog and cat. Encouraging new knitters that need their own tiny pets, the book includes a section on how to knit and many of the patterns are simple enough for beginning and just-past-beginning knitters. 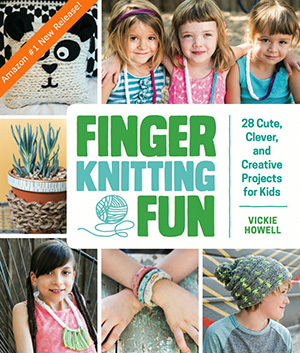 This book would be perfect for summer knitting with any kids a knitter might have in their life who want to learn to knit. The patterns are quick, simple and -- above all -- cute. 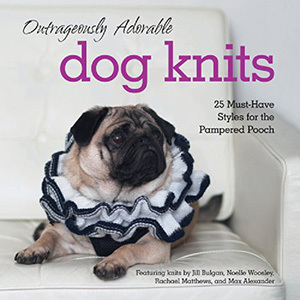 Given the popularity of websites like Stuff On My Cat, and the ubiquity of photos of four-legged family members sporting knitwear on Ravelry, it's not surprising that there's demand for a book like this -- a whole book of hats, scarves, sweaters, costumes and accessories for dogs. 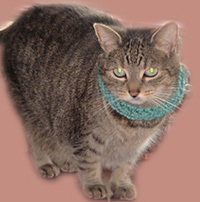 Sizing is not offered for sweaters; rather, the knitter is guided to take some measurements and work those into the pattern provided to make a custom-fit garment for their pet. A word of warning, though: no gauge is given for any patterns that I could find, and no particular yarns are recommended (except for two instances where a specific sort of texture is desired and a specific yarn is named). Yarn weights are given as "double knit", "aran" or "chunky" with a recommended needle size. While your pet will be pretty forgiving about the fit of their garments, the knitter may have a bout of trial and error before getting desired results. The absence of any stated gauge makes me very suspicious of instructions like "Multiply the chest measurement by 5 to gauge the number of stitches needed." Go forth and make cute things, by all means, as they take a smallish amount of both yarn and time, though the first time through they may come out sized for someone else's dog. The back cover of this book demands "COULD YOUR BABY BE ANY CUTER?" and based on the photos here, the answer is "Only in these hats!" 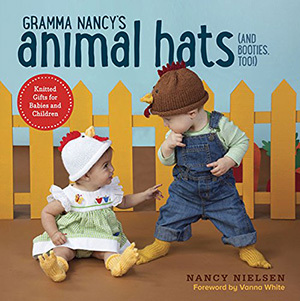 This collection came about because Nancy Nielsen, the titular Gramma Nancy, entered her "Gramminals" in the 2012 Vanna's Choice contest run by Lion Brand Yarn Company, and won the Grand Prize. All the patterns are worked in Vanna's Choice yarn, a widely available worsted weight and washable acrylic with a great range of colours. There are so many animals here -- from barnyard to safari -- that nearly any animal request could be met. I'm particularly taken with how wonderful all the birds are, especially the owl! There are 19 different animal hat patterns, plus instructions for great basic rolled brim and earflap hats. Most of the patterns are accompanied by instructions to knit coordinating "Handsies" (for newborns) or Booties (for older babies). Trust me, little flipper booties for your wee fish, or monkey toes for your tiny primate are completely adorable. "Each hat pattern is offered in four sizes, stepping up every so gradually, so there is a hat size that will fit your little one from the happy day they are born until the sad day they tell you (in no uncertain terms) that they are way too old for Gramminals." 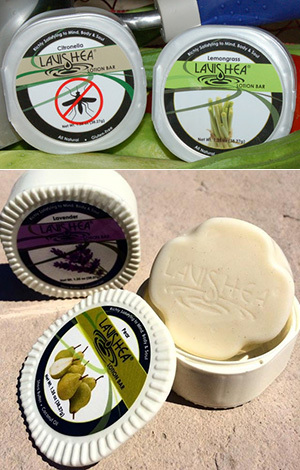 Lotion Bars -- New Scents! The makers of these nifty solid shea butter bars have a couple of new scents on offer AND a new type of packaging. Lynne's Citronella bar contains actual citronella essential oil, and has the advantage of keeping bugs away while smelling pleasantly citrussy. An evening's testing around the backyard fire pit was a success -- she had no bug bites to report while her companions were not so fortunate. Lemongrass was Amy's choice. As someone with a sensitive nose, she found the gentler scent really pleasant. The ability to pack this solid moisturiser in a carry-on luggage means it's going straight into Lynne's bag of travel necessities. I spotted this booth from across the knitting trade show (TNNA) floor a few weeks ago and made a beeline. Shiny packages with little things inside. It was enticing. And then I looked closer. Whether you're a stitcher or not, this kind of thing can't help appeal to the fiber lover in all knittters. For this	revirew,	i	tested the teardrop-shaped bamboo necklace. The kit comes with the pre-drilled bamboo pendant, antquied bronze colored chain, two colors of embroidery floss, instructions and two needles in their own bandaid-like packages. The instructions were helpful, but I wasn't totally clear on how many strands of the floss to use until I visited Red Gate's website (just 1 strand, but you thread the needle in a particular way, which they clearly show). After that, it was a quick hour of stitching and I had the pendant below. Although the colors of floss included were pretty, i had a hankering to try my own combination. I just matched the length of thread in the kit as i cut new floss and it was an easy swap. Hiding the loose bits of floss in the back is easy at the beginning, since the kit shows you how to make a seamless, secure start. The ends are a little harder, but if you make a mess of it, you can easily apply a piece of felt or fabric to the back with some tacky glue and make an even more polished piece. The front looks immaculate either way. This was an hour's project with instant gratification and I absolutely adore the results. It looks great on my neck and has me wanting to make more in different colors. There are other products in the line including earrings, and a variety of pendants in different shapes -- some with silver or black frames around the outside. Clever product, well executed and super fun to finish yourself! I'll get the disclosures right out of the way: I know Kate in real life -- she's my tech editor (and man, a darned great one), I read and provide feedback on her books and other products including this class, and I'm proud to call her a good friend in real life. That said, all the folks at Knitty could say the same things about Kate, and someone had to write this review. :) I'm pretty sure I'm qualified to evaluate newer-knitter information -- after nearly a decade working in yarn shops, I've seen all the troubles a new knitter can run into at least twice. A typical learning curve goes something like this: learn to make the knit stitch; make a garter dishcloth, scarf, headband or other rectangle; learn to make the purl stitch; make a stockinette rectangle thing; wonder what to do next. A ton of information to help answer that last part can be found in this class. 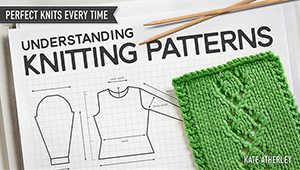 The very first chapter is "Finding a Good Pattern", filled with places to look for a pattern and loads of guidance to help assess if a pattern is well-written, how to know it's within the knitter's skill set, and some flags to look out for to avoid getting into something too complicated. The class goes on to "Yarn & Gauge" and discusses how to choose yarn, how to make yarn substitutions, what gauge is and how to measure it. The third chapter, "Sizing & Measurements", I know would be of use to a lot of seasoned knitters as well. Too many times I've seen knitters disappointed in their finished garment, not because they did something wrong, but because they chose the wrong size to make. Other chapters cover "Working from a Pattern", "Reading Charts", "Ensuring Project Success" and "More Advanced Patterns". These include really useful tips such as what to pack in your knitting kit, understanding how to parse instructions and the language that can vary from pattern to pattern while meaning the same thing, and how to track rows and count progress. It's the sort of collection of really useful knowledge that I wish could be handed to everyone who takes up knitting because there'd be less crying involved and fewer people leaving the craft in frustration. I started knitting lace very soon after I learned to knit so many years ago. Of course there have been plenty of mistakes. Sometimes I let them go and sometimes I fix them. When this class became available, even though I feel like a very experienced lace knitter, I was excited to take it and learn from a lace designer that I really admire. I was not disappointed. Laura is a teacher who takes the fear out of some things that can be very scary. She describes all of her tips and tricks and techniques very clearly and at a pace that is easy to follow. Some of the things she showed were things that I had figured out on my own over the years but it was fun to see someone else's way of doing it as well as some things that may improve my repair techniques. Laura also showed some wonderful methods that I hadn't tried and although I'm not excited to find mistakes in my lace knitting, I am a little excited to try some new things. The class is in 7 lessons and each lesson is broken down into shorter chapters so you can take it as slowly as you like and make sure you have mastered a technique before you move on. Some basics are described such as the proper way stitches should sit on your knitting needles and what is meant exactly by single- and double-sided lace. Some bonuses I found were tips for how to read my knitting. Though I am pretty good at it in progress, I have spent many hours in the past glaring at knitting that happened 10 rows ago trying to figure out where I went wrong. Laura has shown me how to confidently figure out a mistake without feeling violent tendencies to my newly made fabrics. In addition, I feel more positive about dropping back stitches and fixing mistakes in place rather than ripping back hours and hours of knitting. This class was everything I had hoped, plus more. I think knitters of all skill levels will benefit from this class and the calm, confidence-building voice of Laura Nelkin. Full disclosure: I was involved in the technical edit of the first draft of the book this class is based on, but I had no involvement in this class or or its content. For sock aficionados, Lara's class dives wonderfully deep into aspects of sock fit: both sizing and sock constructions. 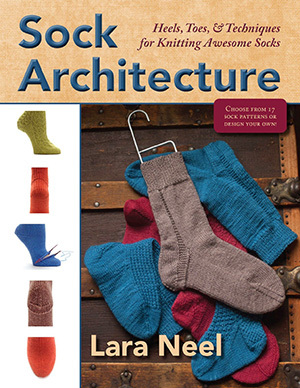 She brings to life many of the key concepts and design elements from her book, Sock Architecture (see review above). Lara provides recipes and instructions for many different types of sock constructions, with lots of detailed information about how they fit, and what feet they work best for. She empowers knitters to create socks to suit their feet -- and their knitting preferences! -- well. There's a huge variety of methods covered, and there's definitely something to suit everyone's needs. This class isn't for new sock knitters, but that's not a bad thing by any means. Lara covers both toe-up and top-down elements, including heel and toe variations that work both ways, and the class is constructed so that you can focus on only the pieces that are relevant to you. There's a fair bit of math in the class, but it's well-explained, and the downloadable worksheets are a huge part of the value of the class. Lara is a friendly and open instructor, and she's able to deliver even the most of complex of concepts in an approachable way. If you're looking to venture off the beaten path with your sock knitting, or to dip your toe into sock customization and design, you'll find a lot of value in this class. Beginner knitters have enough challenge to learn how stitches get made, to learn how to interpret instructions, and then to practice both those things until they are making good fabric and understanding some of the steps involved in making more than just squares. There aren't a lot of resources for the folks at the next step, though. Or rather, there are plenty of resources...once folks know what sorts of questions to ask. I put Patty Lyons DVD set firmly in the category of "answers to questions you maybe didn't know you had". Best-suited to knitters with a few miles on their needles, Lyons covers a wealth of ground with more than 30 demonstrations of the small changes you can make that result in big changes in your finished fabric. There are tricks to cover casting-on (more elastic, more even, better transition to rib) and binding off (more even edges, no gaps). Tips to help in the middle include: more even ribbed fabric, better edge stitches, a whack of tidier decreases, and my favourite -- better transitions from ribbed to stockinette fabric. Lyons includes help for sweater-makers including more accurate measuring of armhole depth, better necklines, picking up stitches around curves and excellent two-row button holes. My only quibble is a technological one, and it has absolutely nothing to do with Patty Lyons very useful content. I have to say, I love living in the future, where I can get instruction from knowledgeable resources when and where I want it. After having experienced the bells and whistles of another online instruction delivery platform, I really found I missed some of those tools, like a direct-access index, the ability to leave myself notes, or to click a button for a quick replay of what I just watched. (I reviewed digitally downloaded files on my laptop, but the experience was the same as if I had played them on my DVD player. Play, stop, rewind and fast forward are all that are available.) I hope Interweave can soon find a way to deliver this great information with a better user experience. The tips here are more than worth the minimal discomfort of this techno-spoiled user. 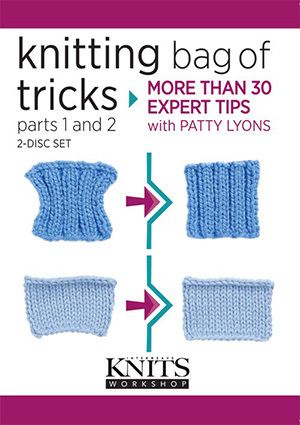 I plan to get myself a copy of Lyons' Advanced Knitting Fixes, available also from Interweave as a digital download or DVD. For many knitters, the mere mention of the word "math" gets a sharp intake in response, almost as if it had been spelled with an "o" in place of an "a"! I'm not one of those folks who thinks it's a dirty word. In fact, I'm pretty likely to bend your ear and tell you that knitting is inherently about arithmetic and by virtue of being a knitter you're already better at arithmetic than a goodly chunk of the population. But even though I'm reasonably comfortable with numbers, my eyes cross at the notion of planning shaping or working out ratios for knitted edgings. Enter the Knitter's Toolbox. 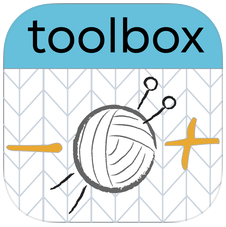 Created by Amy Herzog of Custom Fit fame, this app breaks out some of the calculators used in the Custom Fit sweater engine and makes them available to knitters to use in all sorts of ways. First and simplest is the Gauge Widget. You still have to knit a good-sized swatch -- there's no app, now or ever, that will take that part away. But you click +/- to tell the app the total number of stitches (or rows) you counted and the length you counted them in, and it spits out your stitch (or row) gauge. With the stitch and row gauge you can use the "Pickup Calculator", and have the app tell you how many stitches you need to pick up to make a well-fitting edging such as a button band or facing. In a perfect world, patterns would tell you the ratio they want you to use (pick up 2 stitches for every 3, for example), but most simply tell you to "pick up 104 sts along the right front" or similar. That gets you in very hot water indeed if you tend to lengthen or shorten your sweaters. With this calculator, you use the numbers of the fabric in front of you, and take the guesswork away. The "Buttonhole Spacer" is pretty self-explanatory. 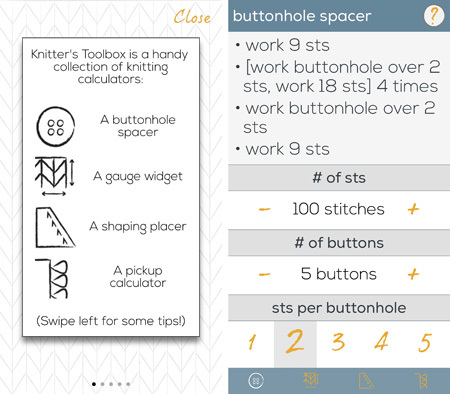 You tell the app how many stitches in your button band (because you figured that out with the pickup calculator! ), how many buttons you plan to use, and how many stitches each buttonhole is worked over, and it spits out instructions to evenly space out your buttons. The last and most powerful part is the "Shaping Placer". You tell the app how many stitches are in your row, how many stitches you need to end up with, and how many times in the row you plan to increase (or decrease) and the app works out the language for the instructions you need to work. This might come in especially handy for those prone to working written patterns in yarn that's a different gauge than the one specified. For the price of one cup of swanky coffee, you can save yourself a lot of scribbling on the backs of envelopes. This is an excellent book for the knitters making the jump to the siren song of weaving. The basics of weaving simple projects on a rigid-heddle loom are given in detail with photographs and illustrations. The book is set up and written to match a different learning styles. You may read it from front to back absorbing all of the information in a chronological way. Or if you have some weaving experience, you could skip around reading only the parts that interest you or reminding yourself of things you've forgotten. Or you can jump right into a project and flip back to the basic weaving instructions to move you along the weaving way. The book is packed with information. Along with the flow of instructions there are sidebars, charts, a glossary, resources, a warping checklist, a project-planning sheet and a sett guide. As I read and had a question, I could find the answer in the book, even if it was in a sidebar or callout box. I love when I book effortlessly answers my questions. 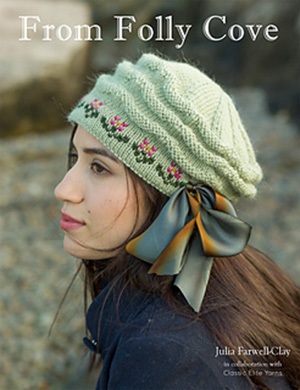 The 17 projects in the book are scarves, belts, bags, pillows -- small things that are quick and easy to weave with yarn I bet is already in any knitter's stash. 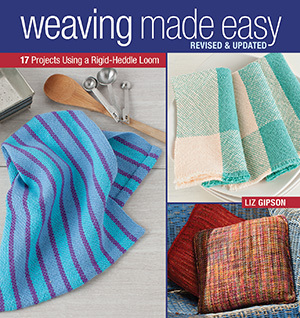 If you have the itch to start rigid-heddle weaving, this is the book to get!